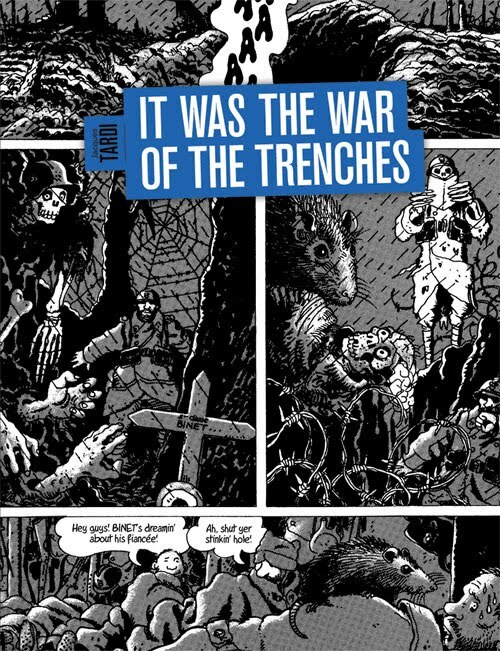 This is a series of short stories about French soldiers during World War I. 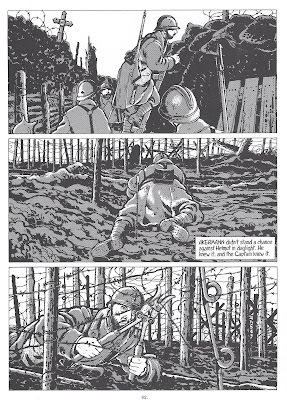 It is the third book by French artist Jacques Tardi that Fantagraphics has translated and published in the U.S. The first was West Coast Blues , a crime story about an everyman on the run from two hitmen that I quite liked. The second was the surreal farce You Are There . And due out in September is The Extraordinary Adventures of Adele Blanc-Sec: Pterror Over Paris / The Eiffel Tower Demon , released to coincide with the new Luc Besson-directed movie. This one seems to be a very personal work, one that occupied a large chunk of Tardi's time (it was begun in 1982 and completed in 1993). A quick and easy way to get a handle on the book can be found in the fact that the two blurbs on the back cover are from Art Spiegelman and Joe Sacco. The book reminds me of Spiegelman's work because it draws from a similar well of aggressive unpleasantness: Spiegelman calls it a "devastating crater of a work . . . a kaleidoscope of war's dehumanizing brutality." The book also is impeccably researched and puts the reader into the shoes of the soldiers in the war, not unlike how Sacco's non-fiction investigations unearth all of the buried details of his chosen topics: Sacco says that "it can be compared to the work of the artists who actually served in the trenches." Everybody dies in this book. It's sad, gory, brutal, depressing, visceral, and overwhelming. It brings those poor soldiers back to life and, instead of celebrating any victories or glorifying any heroic acts, just shoots them in the gut all over again and leaves them to die in the mud and filth of no man's land. It's an impressive work of art that floods the reader with a feeling of hopelessness. 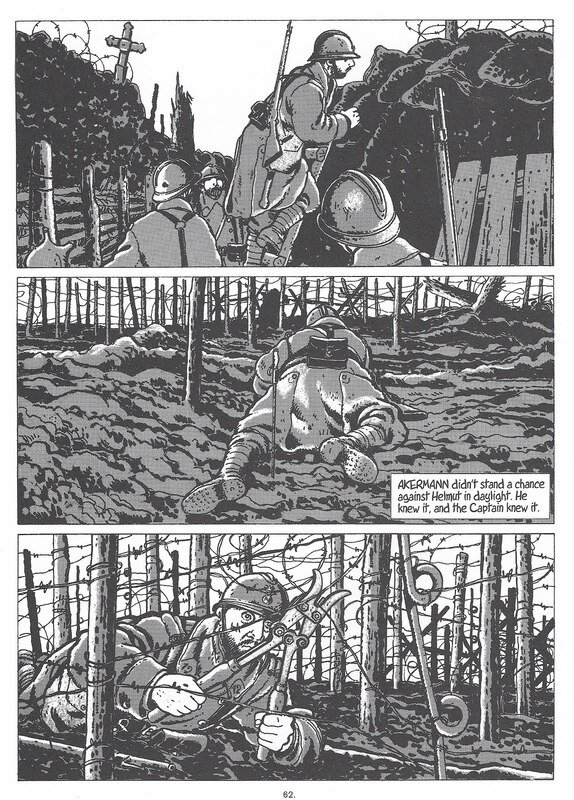 How Tardi managed this feat without having participated in the first world war is really quite amazing. It is worth reading. READ MORE: Here is a ten-page excerpt, Tardi's foreword, and a video/slideshow preview. Here is Tom Spurgeon's interview of publisher, editor, and translator Kim Thompson, and here is an Inkstuds podcast interview of Thompson. Disclaimer: Fantagraphics sent me a review copy of this book. Back in February, I posted a shopping list for the first half of the year. Now, here's your shopping list for the rest of 2010. Many of these books are prime candidates for membership in the Best Comics of 2010 Meta-List. The Sweeter Side of R. Crumb , by Robert Crumb, W.W. Norton & Co.